Rents in northern regions are at their most affordable for a decade, as a result of weaker employment growth and lower barriers to becoming a homeowner in these areas. At a national level, renters spent an average of 30% of their take-home pay on accommodation in the final three months of 2018, in line with the average over the past 10 years, according to Zoopla. But the headline rate masked significant regional variations, with rents in Yorkshire and Humber taking up only 25% of earnings, while tenants in the capital handed over 39% of their pay. The study, which looked at the affordability of renting in the private sector for someone in full-time work, also found that while affordability had remained broadly static in some areas, rents had soared by more than 20% in the past decade in others. Where is it most affordable to rent a home? 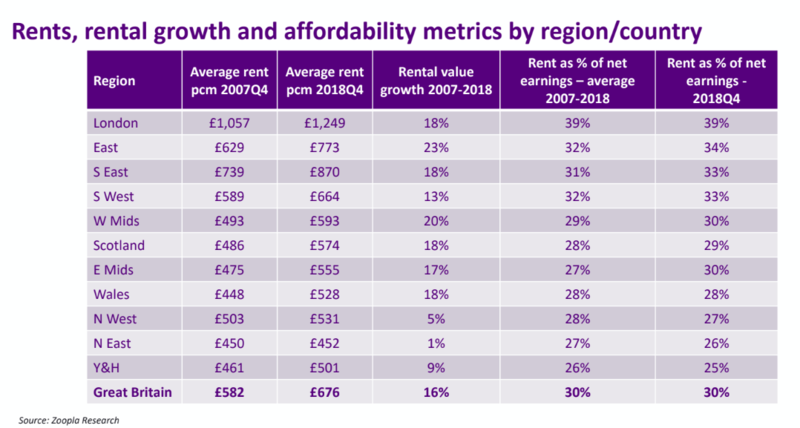 Weak rental growth has left northern regions as the most affordable places in which to be a tenant in the private sector. The north east has the lowest rents in absolute terms at an average of just £452, followed by Yorkshire and Humber at £501 and Wales at £528. But when rents are considered as a proportion of take-home pay, Yorkshire and the Humber is the most affordable region, with tenants handing over just 25% of net earnings. The north east is the second most affordable region with rents that are the equivalent of 26% of take-home pay, followed closely by the north west at 27%. Where is it most expensive to be a tenant? Unsurprisingly, rents are most expensive in London, at an average of £1,249, the equivalent of 39% of take-home pay. The south east has the second highest level of rent at £870, followed by the east at £773 or 34% of post-tax earnings. But the situation is improving in the capital, and after growing rapidly up until 2014 as employment levels expanded and the city saw a high level of in-migration, rents have since stagnated. 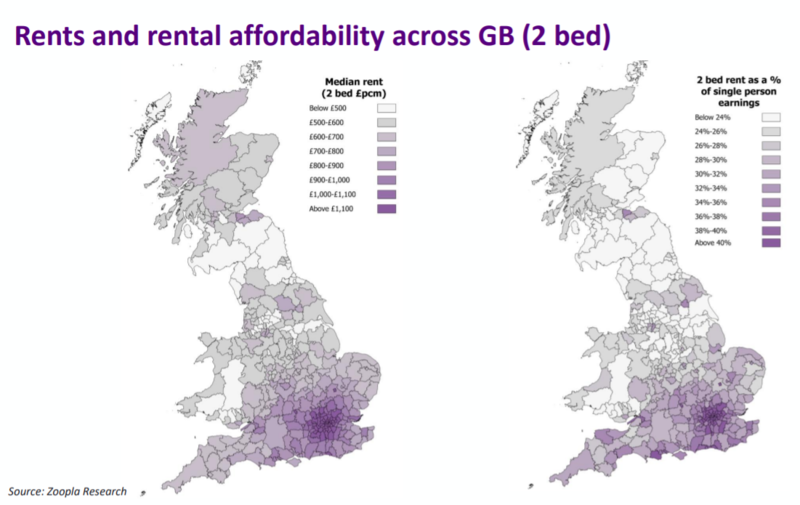 In fact, average rents in London are the same today as they were in 2014 due to stretched affordability acting as a break on further increases. Rental affordability in the capital peaked at 43% of take-home pay in 2017, before falling back to 39% last year, in line with the long-run average for the region. How much has affordability changed in the past decade? Across Great Britain as a whole, rents have increased by 16% during the past decade, broadly in line with changes to average earnings. The north east has seen the smallest change, with average rents edging ahead by only 1%, while rises were also subdued in the north west at 5% and Yorkshire and Humber at 9%. By contrast, the cost of being a tenant in the east has soared by 23% since 2007, while it is 20% higher in the West Midlands. Rents have also been hiked by 18% in London, the south east, Scotland and Wales in the past 10 years. Phil Spencer's advice: Should you buy or rent?